Two species of cattle grubs affect domestic cattle in the Northern Hemisphere. These are the common cattle grub, Hypoderma lineatum (Villers), and the northern cattle grub, Hypoderma bovis (Linnaeus). 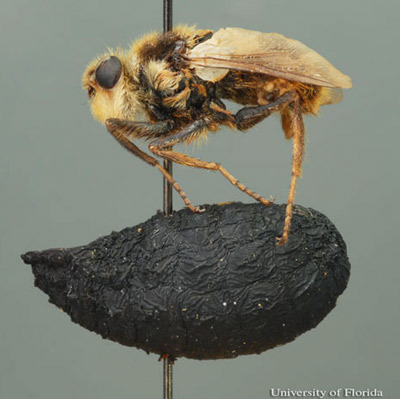 Adult cattle grubs are commonly known as heel flies, warble flies, bomb flies, or gad flies. The common cattle grub occurs naturally in cattle in at least 50 countries in Africa, Asia, Europe and North America, but principally in the region of 25 and 60 degrees latitude in the Northern Hemisphere. The southern limit is reached in the Punjab of India, Libya, northern Mexico and Hawaii. In North America, the common cattle grub ranges from northern Mexico to northern Canada, with the exception of south Texas and Alaska. Adults: The adults are about 13 mm in length. The flies are hairy, with no functional mouthparts, and must mate and reproduce solely on the energy derived from stored reserves. Adults live three to five days. The hairs on the head and the anterior part of the thorax are yellowish-white. 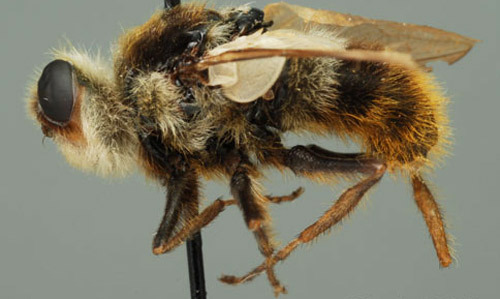 The abdomen is covered with light yellow hairs anteriorly, followed by a band of dark hairs, and the posterior portion bears orange-yellow hairs. Figure 1. Life cycle of a cattle grub. Figure 2. Pinned adult male common cattle grub, Hypoderma lineatum (Villers). Photograph by Lyle J. Buss, University of Florida. 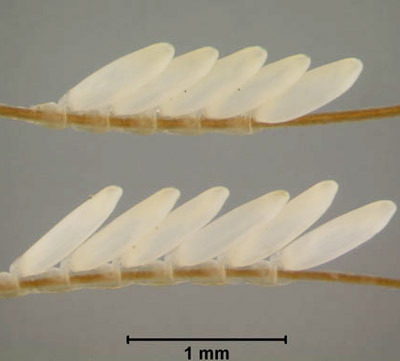 Eggs: The eggs are about 1 mm long and are fixed to the hairs of the host by means of small terminal clasps. Eggs are found on the host animal's legs and sometimes on the body. Females deposit a row of six or more eggs per hair. The flies are very persistent in approaching host animals, and one female may lay 800 eggs on one individual. Figure 3. Eggs of the common cattle grub, Hypoderma lineatum (Villers), on cattle hairs. Photograph by Lyle J. Buss, University of Florida. Larvae: The eggs hatch in four to seven days and the larvae crawl down the hair to the skin, which they then penetrate. In doing so, they cause considerable irritation. They wander in the subcutaneous connective tissue, usually up the leg and then forward to the diaphragm, gradually increasing in size. The larvae find their way into the esophageal wall, where they come to lie in the submucous connective tissue for the rest of the summer and autumn, growing to about 12 mm in length. Eventually, during January and February, they travel towards the dorsal aspect of the body and reach the subcutaneous tissue of the back. When the parasites arrive under the skin of the back, swellings begin to form, measuring about 3 cm in diameter. The skin over each swelling becomes perforated, and the larvae then lay with the posterior stigmal plate directed towards the pore for the purpose of respiration. Here the larvae molt, and this stage lasts about 30 days. The younger larvae are almost white, changing to yellow and then to light brown as they grow older, and finally almost black. Two molts occur during the development of the larvae, producing a total of three instars. Full-grown larvae are 25 mm long. Flat tubercles and small spines are present on all segments but the last. Figure 4. 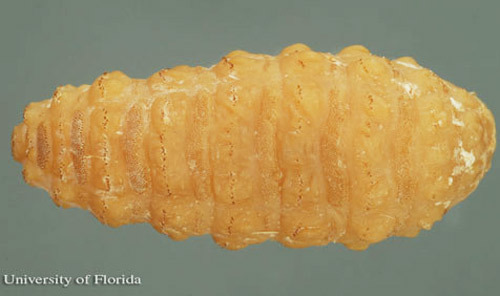 Larva of the common cattle grub, Hypoderma lineatum (Villers), dorsal view. The head is to the left. Photograph by Lyle J. Buss, University of Florida. Figure 5. Larva of the common cattle grub, Hypoderma lineatum (Villers), ventral view. The head is to the left. Photograph by Lyle J. Buss, University of Florida. Pupae: In spring, the mature larvae wriggle out of the cysts and fall on the ground, where they penetrate the soil and pupate. Pupation is almost immediate. The insect will not mature if the moisture content is higher than 10 percent. The pupal case is black and the fly emerges from it after 35 to 60 days by pushing open an operculum at the anterior end. Figure 6. 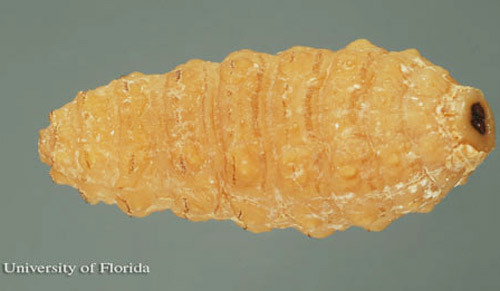 Pinned adult (top) and pupal case (bottom) of the common cattle grub, Hypoderma lineatum (Villers).Photograph by Lyle J. Buss, University of Florida. The total duration of the life cycle is approximately a year, with the major portion of this time being spent in the body of the host. The timing of appearance of the grubs in the host’s back, emergence of the mature larvae and pupation in the ground, and adult emergence correspond to varying weather conditions. However, the time when these occur will tend to be similar from year to year for a given region. The adult flies occur in summer, especially in June and July. They are most active on warm days, when they seek cattle on which to lay their eggs. Although the typical hosts of common cattle grub are cattle and Old World deer, they have been known to parasitize horses and humans. Common cattle grub is also reported from American bison. Goats and sheep are occasional hosts, but development is not completed in these hosts. When the flies approach to lay eggs the cattle become nervous and attempt to escape the attack by running away, and will even go into water. Because the flies are persistent, the animals are constantly irritated and do not feed properly, which results in an appreciable loss of weight and decrease of milk yield. The animals may also hurt themselves severely, or at least become wounded and damage their skins. The larvae irritate the tissues around them, causing the flesh to become greenish-yellow and infiltrated, especially along the tracks where the larvae have wandered, and thus depreciated in value. Great damage is caused to the hide by the perforation caused by the common cattle grub. The annual loss due to this factor alone is very high in some countries. Figure 7. Damage to cattle hide caused by the larvae of the common cattle grub, Hypoderma lineatum (Villers). Photograph by Phillip Kaufman, University of Florida. Except for poor growth in cases of severe infestation and decreased milk yield, the animals show no appreciable signs of harboring parasites until the larvae appear along the back. At this point the swellings can be felt and seen. The larva lies in a cyst, which also contains a yellow purulent fluid. Calves and young cattle are more frequently and more severely infected than older animals. It is possible that cattle develop a certain degree of resistance to the larvae. However, older animals may become sensitized during earlier infections through the absorption of body fluids of larvae that die, and these animals may show anaphylactic reactions when subsequent larvae die or are broken during extraction. Even abortions have been noted in such cases. injury produced to the hide which becomes "grubby" or full of holes where the grubs emerged. Mechanical removal of larvae. Mature larvae may be squeezed out of the warble swelling. This is more successful when the larvae are mature. Rupture of the larvae during extraction may lead to a localized inflammation and abscess formation. Insecticide treatment. The advent of systemic organophosphorous insecticides in the 1950s gave cattle producers the first opportunity to control cattle grubs on a large scale at a reasonable cost. The use of systemic insecticides allows control of larvae while they are in the early stages of migration and before they reach the backs of the animals. The insecticides are used during the autumn and early winter with the aim of killing the younger larval stages. The compounds may be given orally, or in dips, sprays, drench or bolus form, but one of the more convenient methods is "pour on" dressings in which a small volume of concentrated insecticide is poured along the animal's back. Enough insecticide is absorbed through the skin to kill the larvae. These compounds should be avoided in January and February because severe reactions may occur due to the death of larvae in the wall of the esophagus or spinal canal. Drinking water treatments of insect growth regulators generally do not prevent cattle grub larvae from reaching backs of cattle, but may prevent adults from eclosing from pupae, thus preventing reproduction. Insecticide-impregnated plastic strips applied to legs of cattle during the heel fly season prevented the appearance of cattle grub larvae in backs of treated cattle. Perhaps the most promising control technology for use in suppression of Hypoderma spp. has been the development of avermectins (a chemically modified form of a fermentation product of Streptomyces avermitilis). In the early 1980s this antiparasitic compound was established as one of the most effective materials ever developed for systemic use against cattle grubs. This product possesses unique characteristics not seen in organophosphorus systemics. The first of these is an ability to kill migrating larvae, but unlike systemics, it is also highly efficacious at extremely low dosages against second- and third-instar larvae in warbles. The latter activity permits use of this material as a late-season or pour-on treatment for grub-infested cattle that is not possible with traditional systemic insecticides, which are not effective, once the larvae are inside their warbles. Vaccines. Generally, fewer Hypoderma spp. larvae appear in the back of older cattle than in calves or yearlings, which implies the development of some type of immunity with age. Initial investigations, using extracts of Hypoderma spp. larvae as candidate vaccines, have led to concerted attempts toward the development of a defined vaccine against cattle-grub infestations using the hypodermin A (one of the three enzymes which are secreted by the first instar larvae during its migration). The advantages of a vaccine over chemical control are great: less damage to the environment, complete and lifetime conversion of susceptible animals to resistant status, and use in animals such as dairy cattle for which systemic insecticide application is prohibited during lactation. The immunization with hypodermin A, associated with various adjuvants, could provide protective immunity for calves when challenged with natural grub infestation. However, these experimental vaccines have not been widely field-tested against naturally occurring populations of Hypoderma spp. Integrated management. The first attempt at integrated management of Hypoderma spp. resulted from the suggestion to adapt the sterile male-release technology that was developed for eradication of the screwworm from North America and Mexico. The results of a preliminary trial in Alberta, Canada were very encouraging, and consequently, the Joint US-Canada Cattle Grub Project was initiated in 1982. The chemical reduction phase proved to be very successful using readily available systemic insecticides combined with 100% producer cooperation. However, the sterile fly component was less successful because there was no efficient technique for large-scale in vitro rearing of Hypoderma spp. Broce AB. 1985. Myasis-producing flies. In Livestock Entomology. (Eds.) Williams RE, Hall RD, Broce AB, Scholl PJ. John Wiley & Sons, NY. pp. 83-100. Chabaudie N, Villjoubert C, Boulard C. 1991. The response of cattle vaccinated with Hypodermin A to a natural infestation of Hypoderma bovis and Hypoderma lineatum. International Journal of Parasitology 21: 859-862. Drummond RO, George JE, Kunz SE. 1988. Control of Arthropod Pests of Livestock. A Review of Technology. CRC Press, Boca Raton, FL. pp. 77-91. Drummond RO. 1984. Control of larvae of the common cattle grub (Diptera: Oestridae) with animal systemic insecticides. Journal of Economic Entomology 77: 402-406. Drummond RO, Whetstone TM, Shelly BK, Barret CC. 1977. Common cattle grub: Control with animal systemic insecticides. Journal of Economic Entomology 70: 176-178. Harwood RF, James MT. 1979. Entomology in Human and Animal Health. MacMillan Pub. Co. Inc. Seven Ed. NY pp. 307-310. Hunt LM, Beadles ML, Shelley BK, Gilbert BN, Drummond RO. 1980. Control of cattle grubs with dichlorvos-impregnated strips attached to legs of cattle. Journal of Economic Entomology 73:32-34. Jelinek T, Dieter NH, Rieder N, Loscher T. 1995. Cutaneous myiasis: Review of 13 cases in travelers returning from tropical countries. International Journal of Dermatology 34: 624-626. Lancaster JL, Meisch MV. 1986. Arthropods in Livestock and Poultry Production. Ellis Horwood Limited, NY. pp. 230-239. Logar J, Marinic-Fiser N. 2008. Cutaneous myiasis caused by Hypoderma lineatum. Wiener Klinische Wochenschrift (The Middle European Journal of Medicine) 120: 619-621. Scharff DK, Sharman GAM, Ludwig P. 1962. Illness and death in calves induced by treatments with systemic insecticides for control of cattle grubs. Journal of the American Veterinary Association 141: 582-587. Soulsby EJL. 1968. Heminths, Arthropods & Protozoa of Domesticated Animals. Sixth Ed. Lea & Febiger, Philadelphia. pp. 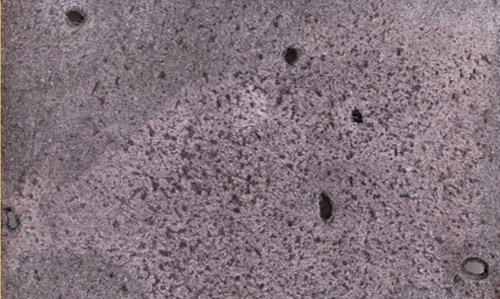 445-448. Warburton MAC. 1922. The warble flies of cattle, Hypoderma bovis and H. lineatum. Parasitology 14:322-341.